Hidden by Time is a collection of numerous physical events imaged with high-speed cameras for classroom study. 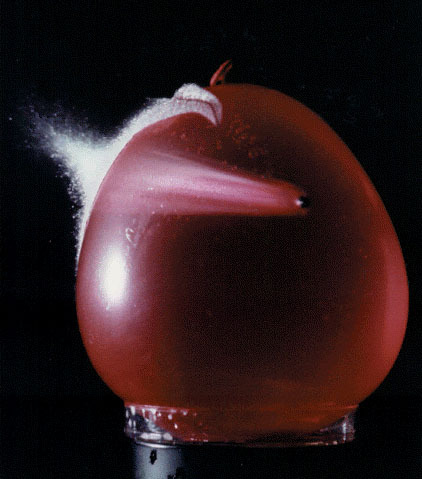 Top: Water balloon impacting surface. Bottom: Racquetball deforming upon impact. 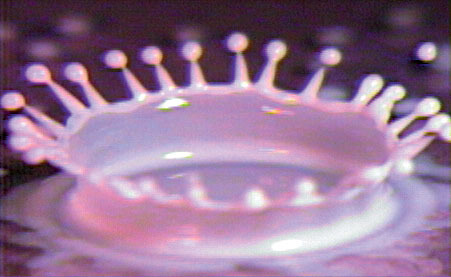 Milk drop impacting small pool of milk. 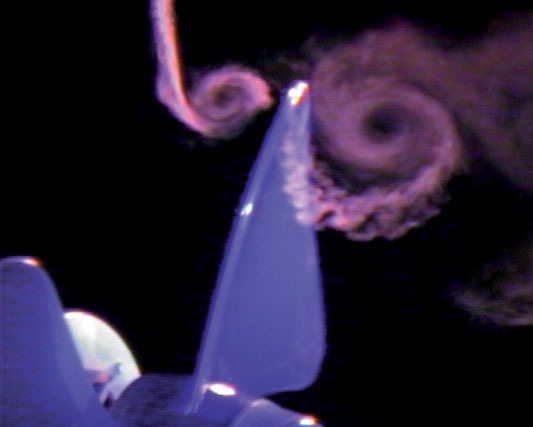 Spiraling smoke vortices produced by rapidly rotating fan blades. BB pellet racing through water balloon before it rips apart. Water drop impacting pool of water. Bullet producing shock waves as it travels through soap bubble. As it rips the card in half, the rotating bullet carves out a spiral shaped slice of card. Sampling of high-speed events, hover over image for description. In a world of motion, many events simply happen too fast to be seen with the unaided eye. With the aid of high-speed cameras, physical events which normally go unnoticed come to life to produce extraordinary sights. High-speed images reveal the awe and wonder of the physical world and provide an intriguing introduction to the study of physics. Designed to capture the attention of students, Hidden by Time is a collection of numerous physical events imaged with high-speed cameras for classroom study. The program is comprised of high-speed motion pictures as well as high-speed still images. Imaging of high-speed motion events was accomplished using a specialized high-speed motion picture camera operating at 1000 and 2000 frames/sec with a shutter speed of 0.04 milliseconds. Contained in the program are over 70 high-speed motion picture sequences involving impacts, collisions, fluid behaviors, and other intriguing physical behaviors. Included in the collection of high-speed stills are over 20 classic images produced by Dr. Harold Edgerton, distinguished for his pioneering work in high-speed photography. Other high-speed still images were produced by Charles Miller, Massachusetts Institute of Technology; and Loren Winters, North Carolina School of Science and Mathematics.